More than simply an architectural biography of a city: Chicagoisms shows Chicago to have an important role as a catalyst for international development and pinpoints its remarkable influence around the world. Chicago has long captured the global imagination as a place of tall, shining buildings rising from the fog, the playground for many of architecture’s greats—from Mies van der Rohe to Frank Lloyd Wright—and a surprising epicenter for modern construction and building techniques. In this beautifully illustrated volume, Alexander Eisenschmidt and Jonathan Mekinda have brought together a diverse pool of curators, artists, architects, historians, critics, and theorists to produce a multifarious portrait of the Second City. Looking at events as far back as the 1933 exhibition Early Modern Architecture in Chicago, Chicagoisms is remarkable for the breadth of its topics and the depth of its essays. 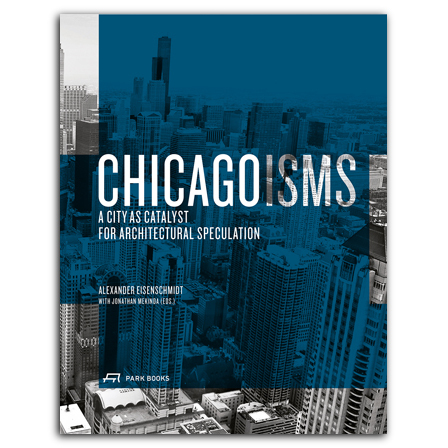 From more abstract ventures like tracking the boom-and-bust cycle of Chicago’s commitment to architecture and the influence of the Chicago grid system on Mies van der Rohe, to more straightforward studies of the “Americanization” of Berlin, the editors have chosen essays that convey the complex and varied history and culture of Chicago’s architecture. More than simply an architectural biography of the city, Chicagoisms shows Chicago to have an important role as a catalyst for international development and pinpoints its remarkable influence around the world. The contributors explore topics as diverse as Daniel Burnham’s vision and OMA’s student center for the Illinois Institute of Technology and show them to all be indelibly products of Chicago. is Meyer Schapiro Professor of Art History and Archaeology at New York’s Columbia University, and has served as the MoMA’s Philip Johnson Chief Curator of Architecture and Design 2007–13. is a designer, theorist, and Assistant Professor at the University of Illinois at Chicago’s School of Architecture. He also works as a curator of exhibitions and is founding partner of Studio Offshore. is a historian of modern architecture and design and an Assistant Professor in Art History and Design at the University of Illinois at Chicago.